It has been a crazy week! After the movers took our household goods last Thursday night, we were left in a mostly-empty house, which required deep cleaning. Between moments of cleaning, we said, “see you later,” to some of our dearest friends. That part of the PCS seemed a little surreal this time. My little sister came to spend the summer with us, and so far, Auntie M’s help has been invaluable! I can do so much while I have a second pair of hands, like run the dogs outside without having to take a preschooler and an infant! I certainly hope Auntie M enjoys her summer with our family – even if it includes sleeping on a couch in a hotel room until we have a home. This is the first move we’ve done where we haven’t had our home figured out ahead of time; instead, we are playing it by ear – primarily because we refuse to buy a home sight-unseen, and because a house on the installation won’t be available to us until August. All short-term rentals in the area require a 90 day lease, so we are currently camping out in a pet-friendly hotel. 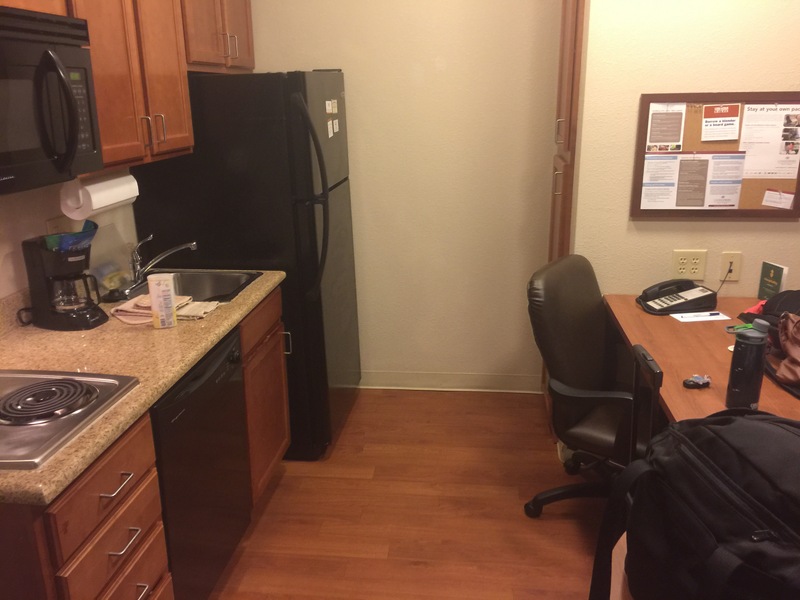 Imagine my surprise when we checked into our hotel room, and I saw the kitchenette that came with the room! A fully equipped kitchen, including many utensils! I am psyched to have access to a small stove (I figured we would have a microwave), and there is plenty of room on the counter for my crockpot. This means, our small family of 5 won’t be having to spend a fortune eating out breakfast, lunch, and dinner; we can forge ahead like normal, preparing the food I know my family will eat, instead of trying to figure out what M may or may not eat on a restaurant menu. 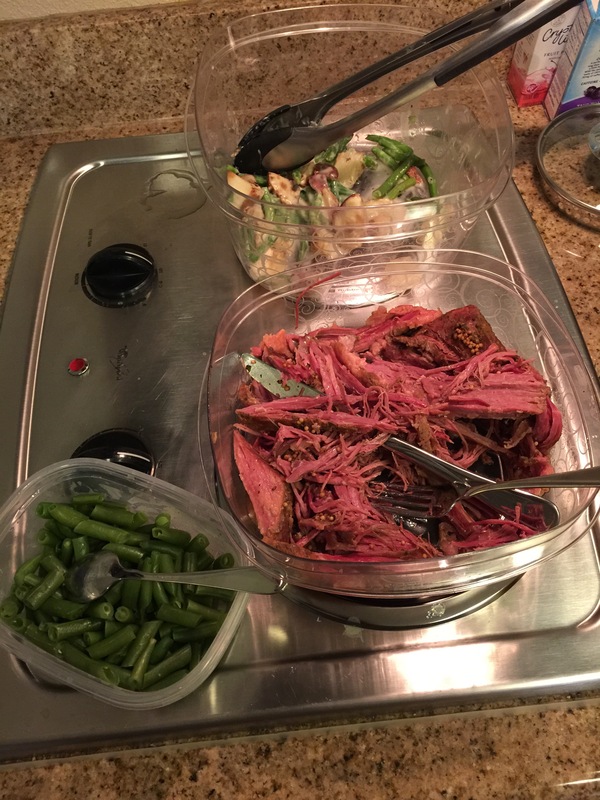 The first dinner in our new city: corned beef, some potato and green bean microwave side dish, and green beans. Dinner of champions! Yesterday, while my husband signed into the installation and started working, my sister, the kiddos and I went out to find a Starbucks. I told my sister my goal is to get out of the hotel room and go somewhere at least once a day. The playground on post is on the bucket list, but given the heat here, will have to be done early in the morning. Another day, we will try to make it to a mid-day Mass on the installation, so as to gauge this chaplain’s receptiveness to small children – from what I have heard, I have high hopes and expectations. Posted on June 16, 2016 June 16, 2016 by Anni HarryPosted in Military lifeTagged Army life, Army wife, Faith, Hotel Living, Moving, New Beginnings, PCS. I am so happy for you, Lovey! I just wish I could have a magic wand to provide a home for you. I am glad that Morgan is working out. this is good chance for her to practice being away from home as she gets ready to do that for real. Thank you! Yes, I think it is a great stepping stone for Auntie M being out on her own!